In April 2017, President Donald Trump and President Xi Jinping met at Mar-a-Lago. In the image above, Trump is sitting - in what for him - is a very rare configuration. His right leg is crossing over his left knee/distal thigh in a "European Style". Although we can't see his right foot - from the angle of his leg, we know it's probably pointing at the Chinese President. In this context, such a foot angle projects respect and/or deference. Note that President Xi has both feet flat on the floor. This body language transmits his greater levels of confidence and strength. The angle of his legs are also not excessively splayed. In addition, although his head/face are turned toward President Trump, President Xi's torso, hips, legs - and probably his feet - are pointed straight forward. This conveys relatively less respect of Xi toward Trump. President Xi also is seated in his own chair - which gives him a significant advantage. The Chinese leader's personal space is protected - whereas President Trump is seated in a less protected - and more "public" space. 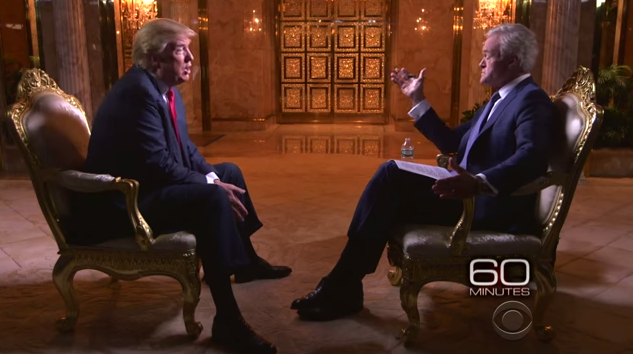 Contrast Trump's meeting with Xi vs. this second image from a 60 minutes interview (September 2015). Note how then-candidate Trump is sitting with legs very widely spread in an extreme example of a "Seated Crotch Display" (colloquially known as "Manspreading"). He's also leaning forward with his torso - and with his hands in a "Low Steeple" (Conventional Low Steeple). This is President Trump's primary default seated display - it's overly-dominant, aggressive, and not recommended. Summary: President Trump's nonverbal behavior in the first image (with President Xi Jinping), although not beta in an absolute sense - is relatively beta when placed in dynamic context with Xi's alpha body language. Although he was on his home turf, Trump committed the tactical error of not planning ahead by not controlling the physical space of the meeting. In this moment, Xi is projecting more power and less respect toward Trump. 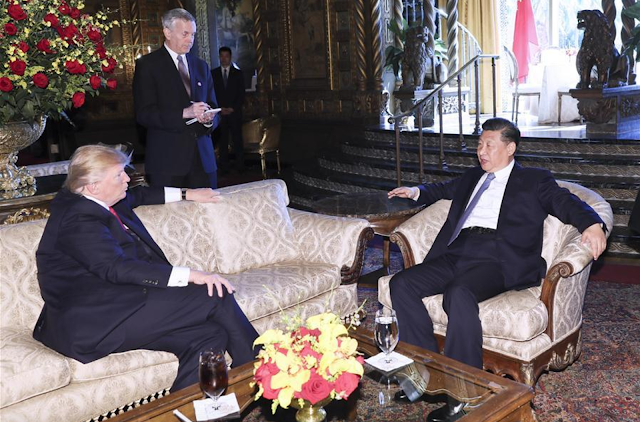 Most notably, President Trump's deviation from his normal hyper-alpha seating position demonstrates Trump was considerably off his game with President Xi. Body Language Analysis No. 4128: Roy Moore's youngest accuser, Leigh Corfman - Interview on "Today"